Modern medicine relies heavily on lab tests and imaging equipment, but some medical tests are so easy they can be conducted in the comfort of your own home. Needless to say, we believe that regular medical checks are the best way to prevent disease. However, some of the early symptoms of specific conditions could be missed during routine checkups. That’s why it is even better to check your own health from time to time using these proven tests targeted at different health concerns. Also, you will learn a lot of health facts as you read. I, for one, had no idea that flexibility is related to arterial health, or that your waistline is not the best place to measure if you want to know whether you have excess weight. THE TEST: You need to do this test in front of a mirror. Pull back your lower eyelid and check the color of the inside of the eyelid. If it’s pink, you’re good to go, but if the color is pale or yellowish, it may be a sign of iron deficiency. 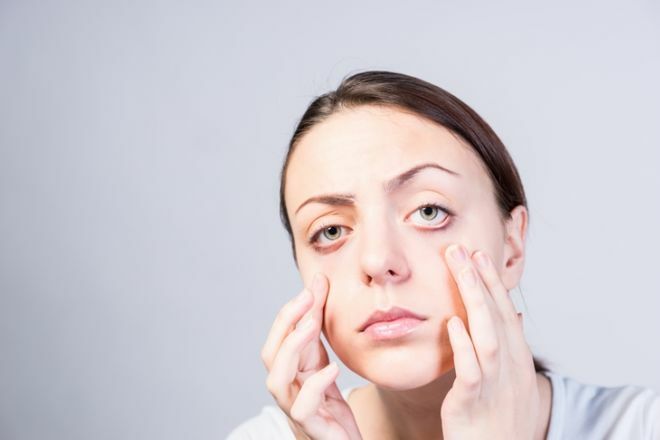 If you are also very pale and get tired very easily, this may be due to anemia, so it’s best to see your doctor. THE TEST: In a quiet room, sit down and rub your right fingers together close to your right ear. You will hear a quiet rubbing sound. Now extend your right hand as far from the ear as you can and repeat. Also, don’t forget to test the left ear as well. Can you hear the sound every time? If so, your hearing is great! It turns out that the best way to know if you’re clinically overweight is by measuring your neck. A 2017 study by the University Hospital Medical School in Sofia determined that a neck measurement over 36 cm for women and 39 cm for men could predict obesity. THE TEST: Get a measuring tape and determine the circumference of your neck. If it’s below the measurements we mentioned above, you have nothing to fear, but if it’s more than that, you will need further physical examination. Numbness of the feet is an often-ignored early symptom of diabetes, which occurs as a result of nerve damage. To test yourself for foot numbness, you will need a partner and a pencil. THE TEST: You will need to take off your shoes and close your eyes, while your partner will have to poke your feet with either the sharp or the eraser side of the pencil without telling you.You will need to identify yourself whether it’s the eraser side or the sharp side. If you can guess, you have nothing to fear. If, however, you couldn’t tell them apart, you need to see a doctor. By the way, the same symptom can occur in persons with lupus and Lyme disease, all of which require professional treatment. 5. Lung and cardiovascular disease. THE TEST: First, find a set of stairs that has 8-12 steps. Now, while you’re walking upstairs, talk, sing or read something out loud. If at any point of the journey upstairs you feel short of breath and your heart is pounding, it could indicate that your lungs and circulatory system cannot handle the workload, so better get them checked. 6. Hormone imbalance or lack of vitamins. Humans shed over 50 strands of hair every day and its part of our natural life cycles, but too much hair loss can indicate a health concern. THE TEST: If you gently rake through your hair or pull on it slightly and more than 3-4 hairs fall out at a time, it might be a suspicious symptom. Don’t run to the doctor just yet, though, as hair loss is a common symptom of stress. If it persists for a longer period of time, however, consider a trip to a doctor as it may indicate a hormonal imbalance or vitamin deficiency. 7. Heart and lung disease. THE TEST: This test is called Schamroth’s window and it is used to tell whether someone has nail clubbing, a symptom of poor oxygen supply to the extremities due to chronic lung and heart disease. Curl your pointing fingers like on the photo and connect the two fingernails. 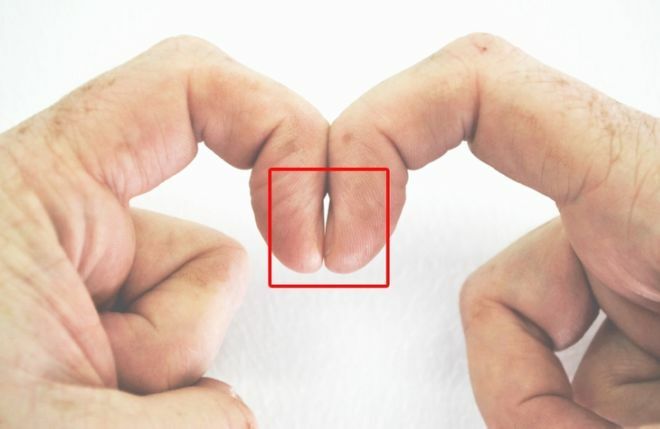 Do you see a tiny space in-between the fingers like the one we highlighted in the picture? Great, you’re fine. If, however, there is no such space, it may be a sign of clubbing.